Hello my skincare junkies! I'm back with another skincare recommendation, and this time is especially for people who find problems with acne, redness, sensitive skin, blemishes, and even eczema or rosacea. This magic remedy called Dr Jart Cicapair Recover - Derma Green Solution. If you are a fan of Korean brands then you knew this doctor already since its been so popular in Korea and worldwide. Dr Jart is a well-known brand from Korea that has a concentration more into the problematic skin with their natural ingredients, high technology, mixed together with the dermatologist recipe. Is a very trusted brand for every skin type to try! This Dr Jart Cicapair series is very very popular in Australia (I worked for Sephora Australia so I knew their best sellers). They have many products lined with this Cicapair thing. As a dry skin team people, I don't really need this product because I don't have acne or blemish or redness either (yes lucky right thank God but I have the dry skin problems tho, don't worry lol). BUT! I do really curious about this thing since its very popular~ Let's take a deeper look! Basically, it works like a moisturizer that you can apply after serum. But it has SPF 50 in it which make this product amazing. Plus it has a green-to-beige color that can be a color-corrector for you redness, that makes this product more amazing right. The formula is heavy and creamy. It's not easily blended, it is green (like Hulk) but when you rub into the skin, it turns into beige and mimicking your skin color! Super nice~ We all know the green cream function - yes, it can cover redness nicely. You guys know my skin is very dry, sometimes I mix this cream with a face oil just to make it easier to blend. Surprisingly I find it very good for my skin as well, works as a sunscreen and a primer. It absorbs quickly and the smell is very lovely. 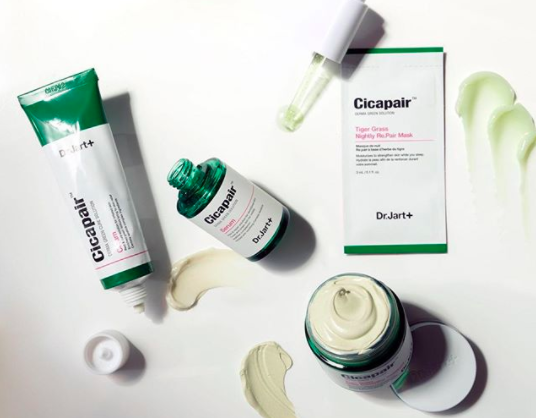 I know this article might not help you a lot since I don't have a before-after picture showing how great this product to treat my blemishes BUT remember I worked in Sephora, I saw so many people who love this Dr Jart Cicapair series. It is really working, you can see the real effect on people with those problems: acne, blemishes, redness, sensitive and irritated skin. It not only covers the redness but also slowly heal the problems and give protection from the sun. Even though I ain't the direct consumer of this benefit, I am also loving this product - so my conclusion is: everybody can use this product. How awesome it is! I think the reason why Dr Jart is very popular in Korea also globally is the uniqueness of the ingredients - they are natural, scientific proof, cruelty-free, and work the claims. I do really recommend this for people with those problems I mentioned before. I hope this can help your skin while another lifestyle maintenance is needed such as exercise, diet control, enough sleep, and never skip cleansing routine. I've heard about this brand before and it sounds wonderful! Thanks for sharing your thoughts on this product.